This is the XFL Show Episode 50: What’s the Big Deal? With new information regarding details within the XFL’s stadium agreements, this week’s show takes a look at exactly what the league is giving it’s 8 host cities to play games and why. Could a bigger than expected TV deal be in the works? Also, get the latest news from the coaching ranks and how it could affect Oliver Luck’s search for the 8 HCs/GMs. As we anticipate the NFL’s dreaded “Black Monday” and the XFL announcing the 8 Head Coaches/General Managers for their 8 teams, this week features a lengthy discussion on potential candidates. From “pie in the sky” names to realistic ones, on this episode you will get an assessment and a lively debate on what will make a perfect leader for each XFL team in 2020. XFL Director of Player Personnel Eric Galko gives us a behind the scenes account of what is being done by the XFL to acquire talented players. This is a fascinating conversation where Eric discusses, in detail, the types of players that will make up the XFL, as well as how the league is using Optimum Scouting to assist it’s future coaches and general managers. The XFL has revealed some of the rules that will be tested out prior to the 2020 kickoff. This week we enter the “Football Laboratory” and discuss which new ideas to re-imagine the game are good and which ideas need to be dropped. Also, an NFL coach is very excited for the XFL coming to his city and details on the league’s deal with the city of St. Louis. Get to know the 8 cities and venues announced for the 2020 XFL season! This week’s show recaps the most eventful week for the XFL since the return was announced in January, featuring a break down of each of the 8 XFL cities and their stadiums. Alan, Vince, and Jake also discuss everything coming out of the test practices and test game being conducted by the league with junior colleges in Mississippi. 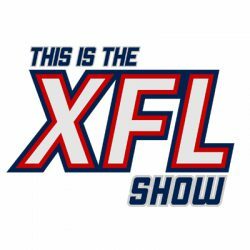 This episode is loaded with XFL news you need to know as we celebrate the biggest week for the league thus far! Get a complete recap from today’s monumental press event as the XFL has now officially revealed all 8 host cities for the inaugural 2020 season. Bryant runs down all the events of the live press conference while Alan, who attended the event at MetLife Stadium, gives a detailed account you can only get here!